Abdul Rashid Salim Salman Khan is a Original Name of Superstar Salman Khan.He was born on 27 December 1965.He is an Actor and Producer.He is The Biggest Superstar of Bollywood today. 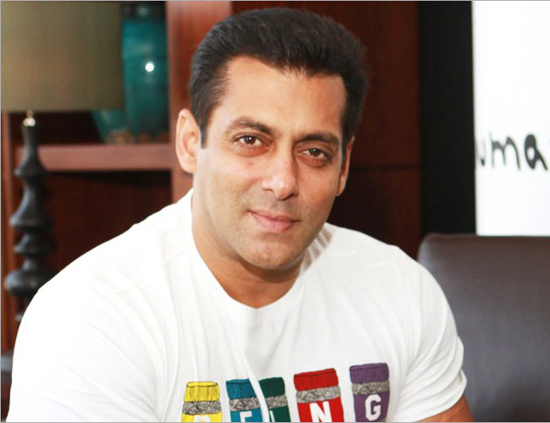 Salman Khan received many awards including 2 national award as an producer and 2 filmfare award as an actor. He Is the Among Most successful actor of all time. Salman Khan Was Debut with Movie "Biwi Ho To Aesi" but His First Movie as a Leading Hero is "Maine Pyar Kiya'(1989) Which was A Instant All Time Blockbuster.The Actress of movie was Bhagyshree. Movie was directed by Sooraj R. Bharjatya.Its a Romantic Family Drama Movie.Its a Highest Grossing movie at that time. Salman was Nominated for best actor in filmfare. In 1990,he has only One film named "Bhaagi: A Rebel of Love".Movie was a Commercial Success For Him. In 1991,He has Many Successful Movies Like Kurbaan,Sanam Bewafa and Sajan. Sanam Bewafa and Sajan were Superhit on box office. Kurban was also a hit on Box Office.He has Only One Failure in 1991 which was Pattar ke Phool. Salman Khan was returned with Sooraj Bharjatya again.They Made "Hum Aapke Hai Kaun" which was the Biggest Blockbuster of Indian movie history.The movie is second all time blockbuster after "Maine Pyar Kiya".Salman Khan Co Star In the movie was Madhuri Dikshit Whose Become Superstar Actress After The Movie Huge Success.Movie Done unbelievable Collection On Box Office.Movie Has Won 3 Filmfare award including Best Film,Best Director and Best Actress and One National Award For Best Picture Film.Movie was Broke Many Box Office records. In 1995,He started in Karan Arjun which was also a Blockbuster on box office.Movie was Directed by Rakesh Roshan. Movie is Also started by Shahrukh Khan. In 1996,He Performed 2 Movies.One is Sanjay Leela Bhansali Director Debut Khamoshi: The Musical and Second was Raj Kanwar Movie Jeet. First was a Box Office flop but Jeet was a Superhit Jeet also Stared By Sunny Deol. In 1997,He has Two Release With Auzaar and Judwaa. Auzaar was A Box Office failure but Judwaa Is A Superhit. Judwa was the first collaboration for Salman khan with David Dhawan. In 1998,He Starred In "Pyar Kiya To Darna Kya" With Kajol which was the Biggest success of the year. "Jab Pyar kisi Se Hota Hai" was also released in same year but movie was a semi hit. In 1999,He Starred In Three Hits Movies Which was Hum "Dil De Chuke Sanam" With Ajay devgn and Aishwarya Rai. Movie was directed By Sanjay Leela Bhansali. Movie Receive Huge critical Acclaim. Salman Khan Praised For his role in Movie.Second movie was Biwi No.1 which was a Second Collaboration with David Dhawan. Movie was a big hit.Third movie in that year was Sooraj Bharjatya Third Movie With Salman Khan which was Hum Saath Saath Hai.Movie Was a Big Success but Not huge as Hum Aapke Hai Kaun. In 2000,He Starred In Movies Like har dil jo Pyar Karega and Chori Chori Chupke Chupke. Both The Movies was Below Average On Box Office. In 2003,He Comeback with Movie Tere Naam Which was a hit.Later he Starred Many Successful Movie Like Mujshe Shadi Karogi and No Entry and Flop like Jaaneman and Baabul. In 2007,He Delivered Blockbuster Partner With David Dhawan and Govinda. He was also do Salame Ishq and Marigold which was Box Office disasters. Year 2009 is the Turning point of Salman Khan Career with the Hit Movie Wanted.Wanted made Comeback of Superstar Salman Khan Era.This Year Saw Failure of Mai aur Mrs Khanna and London dreams. In 2010 Salman Khan Starred In Anil Sharma Movie Veer Which was Flop at box Office. But Dabangg Movie Changed The Career Graph Of the Superstar. Dabangg was a Blockbuster and made many records on box office.It smashed record of three idiots Movie of first week and Collect Wopping 141 Cr On box Office. Dabang Received National Award for best pictures in popular category. Dabang Made the Superstar Salman Khan. In 2011,Salman Gave Blockbuster Like Ready and Bodyguard.Ready earned 121 Cr on Box Office and Bodyguard Grossed Nearly 147 Cr Net. In 2012, Salman Khan Starred In Yashraj Production Movie Ek Tha Tiger With Kaitrina Kaif.Movie was Directed by Kabir Khan.Movie Was a All Time Blockbuster On Box Office and earned 198 Cr. Movie Break The Opening day Record with 31 Cr on Day One Collection.the Second release of Salman Khan in 2012 was Dabangg2. Movie was a Blockbuster With a Collection of 151 Cr. In 2014, He Delivered a Below Average Movie Jai Ho which under performed on Box office.His Next Movie was Kick which a Remake of Telugu movie Kick.Kick Entered in 200 Cr Club and Become blockbuster. In 2015,Salman Khan First Movie was Bajrangi Bhaijan which released on Eid. Movie Entered 300 Cr Club.Movie Grossed Over 315 Cr Net In India.Movie was Ranked All Time Blockbuster on Box Office.Movie Directed By Kabir Khan.Movie Hugely Praised By Critics and Viewers.Movie was a Second best Grosser After Aamir Khan Movie PK.On Diwali Salman Khan Came with Sooraj Bharjatya Comeback Movie Prem Ratan Dhan Paayo.Movie was A Hit On Box Office and Grossed around 171 Cr on Box Office.Movie received Mixed Response From Critics and Audience. In 2016 Salman Khan gave another Box office Blockbuster with Sultan.Movie Highly Praised By Critics and Audience.Movie Entered In 300 cr Club. Salman Khan 2nd Movie Which Entered In 300 cr. Movie directed By Ali Abbas Zafar and Produced By Yashraj. Salman Khan Upcoming Movies will Kabir Khan Tubelight and Tiger Zinda Hai which will be a sequel of the movie Ek Tha Tiger. Salman Khan Host A Reality Tv Show Dus Ka Dum On Sony Tv. Salman Khan Host Bigg Boss On Colors Tv.Salman Host Bigg Boss 4 to Bigg Boss 8 Season. Salman Received National Award For Best Picture Film In Popular Category for Bajrangi Bhaijan. Salman Khan Received Best Male Debut Filmfare award for Maine Pyar Kiya. Best Supporting Actor Award for Kuch Kuch Hota Hai. Salman Khan Nominated for Filmfare awards in many times including Hum Aapke hai Kaun,Karan Arjun,Hum Dil De Chuke Sanam,Tere Naam,Pyar Kiya To Darna Kya,Dabangg,Bodygurd,Bajrangi Bhaijan and Sultan.